WHEW!! What a day!! We begin at what Alan Holman would probably rate around a negative 3 today, no jingles, sound gremlins are out in full force. But Iron sharpens Iron, and we WILL persevere!! The MADNESS of today’s stories…SHEESH!!! –To start, Walt HAS to vent on the planned event that happened at the mosque in New Zealand on Friday. His IRM Ballshit-Meter Rating? 10 Zillion! 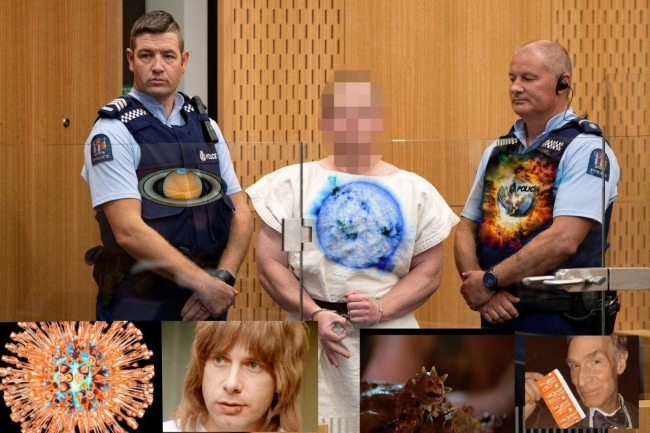 No blood spray, a photo of the “suspect” in custody…but now his FACE is PIXELATED?? Magic bullets have come a long way since JFK…now the casings eject and become INVISIBLE. Seems we DO have stealth technology!!! –THEN…oh, here comes the Space Lettuce!!! Today it’s all about the mysteries of it all. From the unknown but scientifically assured end of our universe…in 10 years…or 10million trillion trillion trillion trillion trillion trillion trillion trillion trillion trillion trillion years. Give or take. –Hold on…this one is a doozy! “If two pieces of the same type of metal touch in space, they will bond and be permanently stuck together. This amazing effect is called cold welding. It happens because the atoms of the individual pieces of metal have no way of knowing that they are different pieces of metal, so the lumps join together. This wouldn’t happen on Earth because there is air and water separating the pieces. The effect has a lot of implication for spacecraft construction and the future of metal-based construction in vacuums.” Dumb metal.